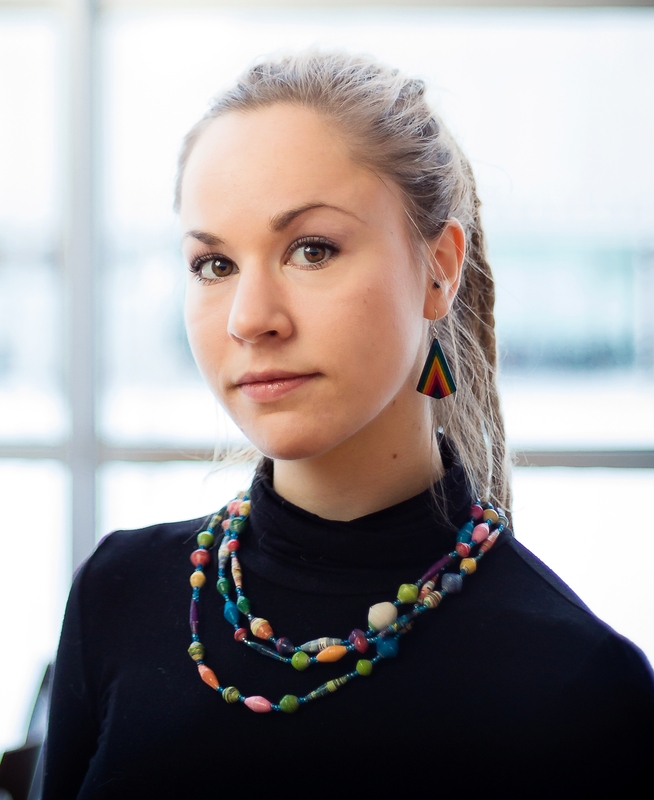 Hanna Sarkkinen is a 26 years old politician from Oulu, Finland. She has a master’s degree in history, and is currently a member of the Oulu City Council, where she is the chairperson of the urban planning committee. She is also a leading figure in the Left Alliance, as the chairperson of the Party Council and a member of theExecutive Board of the Party. I have been in politics now for around seven years. I started in youth politics and I joined the Finland Left Youth Organisation and I was an activist. In 2008, the the Left Alliance (Vasemmisto), asked if I could be a candidate for the communal elections , I was elected and I am now involved in communal politics. I am in my second mandate as member of the city council in Oulu and I am the chairperson of the Communal Planning Board. My biggest drive for politics is to have some kind of impact, to change things, but I also feel that politics is a good environment for me to express myself because it is so diverse and I am this kind of person who is interested in everything. You get to do and you get to know all fields of human life and society, so I get to express myself quite well. From education point of view, I am an historian. I graduated from Oulu’s University one year ago, and I have a minor in administrative sciences, politics and economics. I feel that it prepared me quite well for political activities..
You indicate on your blog that you are a red-green? It means that I am of course in the Left Alliance so social equality questions are very important to me, but also that environmental questions are a major issue. We cannot solve the environmental problems if we don’t also change the economic system. So environmental questions, economical questions and social equality questions go hand in hand. In that meaning I am red and am green. For me, it is the main topic, but I have a number of other matters that I fight for, for example sustainable energy solutions, recycling, material efficiency… I also really consider that we have a taxation problem: evidently we need tax policies which will diminish the income gap, to fight the recent increase of inequalities, but also to plug the international tax leaks, with these big international corporations who are selling in Finland and do not pay the same taxes as Finnish companies. What is your role as chairperson of the party council? The structure in our party is that we have a huge party congress every three years and there we choose the Party Council that has 56 members, if I remember correctly. The members come from all over Finland and that is the highest decision making body between the party congresses every three years. We have two or three meetings every year and we prepare the party’s programmes, we prepare elections, in a way we define the party’s political way based on the congress’ orientations. I am the head of the Party Council but I am also involved in the party decision making board which meets every month and then I am a member, as Head of the Party Council of the party’s executive board, a small group composed of the general secretary of the party, the head of the party’s parliamentary group, the vice-presidents of the party and myself. So I travel a lot to Helsinki to participate in the decision-making process. What is the opinion of the party about the participation in the previous government? I think it was a good decision to be in the coalition because I think parties always have to strive to be in the government to make their goals become a reality. I admit that it was not easy to be in the same government with National Coalition Party, Kokoomus, because our economic understanding and goals are so different. But the programme we agreed upon was quite good and we could accept it as a party. Of course there were some issues that were not so pleasant for us but in overall the programme was acceptable. The result was not too bad: through decisions on social security and taxes, we were able to diminish the income gaps in Finland in 2011 and 2012. Lowering the income gaps is one of our biggest goals, and that was probably the best way to lessen the poverty in Finland. But then we had to leave the government, and I totally agreed with it, when the decision came that social security was going to be cut in spring of 2014. So I supported going to the government but also supported leaving it when we did. If we go to more international topics, what is your opinion about the crisis in Ukraine and the relations with Russia? I think that the Ukrainian crisis is somewhat scary, and it also quite surprising to have this kind of conflict in Europe. We have been living in the belief that in Europe war does not happen anymore: I was born in 1988, and Europe has been quite peaceful in my adult life. Of course, we cannot accept what Russia has done in Ukraine, taking Crimea and supporting the rebels in Eastern Ukraine. So I think the Russian actions are wrong. What should we do with Russia now in the European Union and in Finland? For me, it is very important for Finland that we try to keep our relationship with Russia, that we do not block the border or anything like that because we have to live with Russia also in the future and we need to have some kind of good relationship but of course at the same time we have to say clearly that we disagree with what has been going on in Ukraine. In Finland, the NATO question is a big debate now, as people think that we may be also under some kind of threat from Russia. I believe that joining NATO is not the right way for Finland and I believe that it will not increase our security. In fact, it will decrease it because Russia sees NATO as an enemy, but not Finland, as we are not part of NATO. We have a long border, and we need to keep a good relationship with Russia. And I don’t believe that there’s today any kind of direct threat to Finland from Russia. In the international domain, why are you the only big party supporting the Greek Government in its requests? We are supporting Syriza in Greece because it is like our sister party: there is this European left party group, where we are with Syriza. Before they were this big party, we already had connections with them and we have people who know each other from the Left Alliance and from Syriza. It began a long time ago. You have to realise that the Greek crisis is not Syriza’s fault, because Syriza came in power after the big old parties had already ruined the economy. Syriza is trying to correct the economy, to fight the crisis, because in Greece there is this big social crisis as well. Poverty becomes unbearable; people die because the health care is not financed; children suffer; pensioners cannot survive on what is left of the pension. But unfortunately these kinds of topics are not discussed in Finland or in Germany or in other EU countries, we just talk about the debt but not about the ongoing humanitarian crisis . In addition, Syriza has understood that austerity programmes will not solve the crisis, because the problem is that the economy doesn’t grow or it grows so slowly: there is no demand in the Greek economy because of the austerity programmes, everybody has less and less money, nobody is there to buy the production, so the economy is slowing down when the opposite would be necessary. It is an economic mistake that we, EU countries, have imposed on Greece: when the Greek economic crisis started, they actually had a lot less debt than they have now, so the austerity programme imposed to Greece has not solved the problem, it has made it worse. Today, we have to be realist: the debt level is not sustainable. The country cannot pay back, I do not see how it could happen. It is realism, real politics, to admit it and to make some kind of arrangements for Greece to rise from the crisis in order to be able to pay a part of its debt. That is why we are supporting Syriza in their effort to ease the debt burden. I don’t believe that the Greek economy will rise with the European Commission and Troika asking to continue to cut the social benefits or to privatise public services! But there are other problems in the Greek economy such as an industry base which is not very strong: they would need new sectors for economic growth. Then there is tax evasion and also a lot of corruption that Syriza wants to correct. This can be asked from them. When you will be elected, what would be the first law, the first decision you would like to see in the parliament? Personally, if I had to make a choice, I think the most important thing would be that the progressive taxation would be expanded also to the big capital income. In 1993, I think, the government of Esko Aho made this decision that the general income tax and capital income tax would be differentiated. Since then, the income gap in Finland has been growing the fastest in the OECD countries because now the big capital income taxation is a lot lower than in a normal income. So people with some capital who have capital income pay lower taxes than normal people who go to work, even with the same average incomes. It would give government reesouces to pay the debt and fund important public projects. It would take the money from the wealthiest people in Finland, who would not have anyway used this money for their own consumption. Also in the long run, it would diminish the income gaps which have been growing for the past 25 years. So I think that is a big structural question. For these coming elections, what is your idea about the possible results and the possible coalition and the participation of the Left Alliance in the new government? I don’t think that we could go in the same government anymore with the National Coalition Party, Kokoomus. So I hope that Kokoomus will lose the election, so they will not form any government. The best base for the government coalition, as the Centre Party seems to lead the race, would be a coalition with the Centre Party, the Social Democrats, the Left Alliance and the Greens. I believe that it would be the best base for the government and when you look into history, it has been this coalition between the Centre Party, the Social Democrats and the Left who has made all the big achievements and has built actually the welfare state from the 50s maybe to the 70s or 80s. Historically, this kind of coalition has been very successful and I believe it would be the best coalition also for today. And for me, the worst base that you could have would be a complete right wing government, so National Coalition Party, Centre Party and the True Finns – that would be a nightmare! How is your own campaign doing? It has been going very well. I have a big support group, Hanna’s Gang we call it, so I don’t have to do everything myself. We have done many papers, TV commercials, videos and we’re very active in social media because we are trying to also get the message through to the younger generations and the younger generations don’t really come when I am standing in front of some shops or on the marketplace. They will come to discuss but they go into the internet and search things from there so social media and the internet are quite important for my campaign.